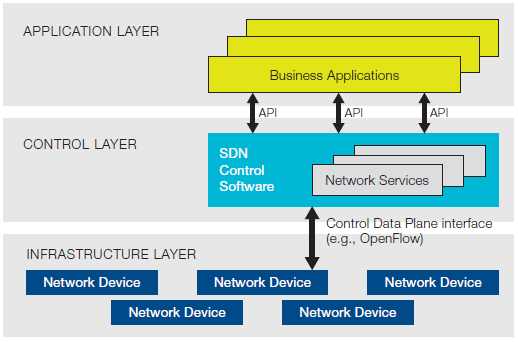 SDN is an enabling technology for network transformation, but it is not a one-size-fits-all model. Models vary based on the current and future needs of the operator, which in turn are based on the underlying network infrastructure. What is essential in all cases however, is that there exists a cohesive operational process by which customer services can be dynamically deployed end-to-end, while the network is centrally controlled with fine granularity to maintain exceptional customer experience. Multi-tier SDN control is the key. 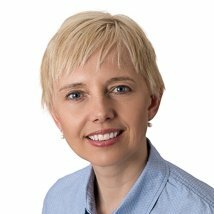 Marie Fiala is Director of Portfolio Marketing within Ciena’s Blue Planet division, where she focuses on driving customer business value through market adoption of SDN/NFV technology innovations. With 25 years in the telecom industry, Marie’s experience spans software start-ups and large multi-national companies, in global marketing, strategic planning, program delivery, and product development roles. A couple of months ago, Ciena launched its new Blue Planet Manage, Control and Plan (MCP) software, a one-stop-shop for managing Ciena packet and optical infrastructure with agility and simplicity. Given the amount of functionality packed into the product, the importance of the middle letter “C” was somewhat overlooked. In fact, MCP is centered on software-defined control, abstracting away the details of underlying infrastructure, and providing programmatic interfaces northbound to business applications. In effect, MCP serves as Ciena’s domain controller, bringing programmability and agility to lifecycle operations across Ciena infrastructure. Ever since Software-Defined Networking (SDN) was introduced 5 years ago, as depicted in Figure 1, it set off an innovation spark in network strategy teams globally, in the high hopes that the technology would solve legacy telecom challenges. As years of development, trials, and deployments have shown, SDN is not a silver bullet, but a strategy that requires a long-term vision, systematic execution, and coordination across multiple network domains and organizational teams. Furthermore, SDN works best in combination with other technologies such as Network Functions Virtualization (NFV) and Cloud Computing, to deliver service agility and reduce OPEX/CAPEX. Just as SDN is not a silver bullet, nor is there a single SDN controller that meets all needs across multi-vendor, multi-domain networks. As most technology strategists responsible for large scale networks have come to realize, the pragmatic approach is a multi-tier SDN model. Such a model is effective in abstracting the technical complexities from the underlying hardware, or virtualized network functions, a layer at a time, and presenting open interfaces to the higher layer applications. 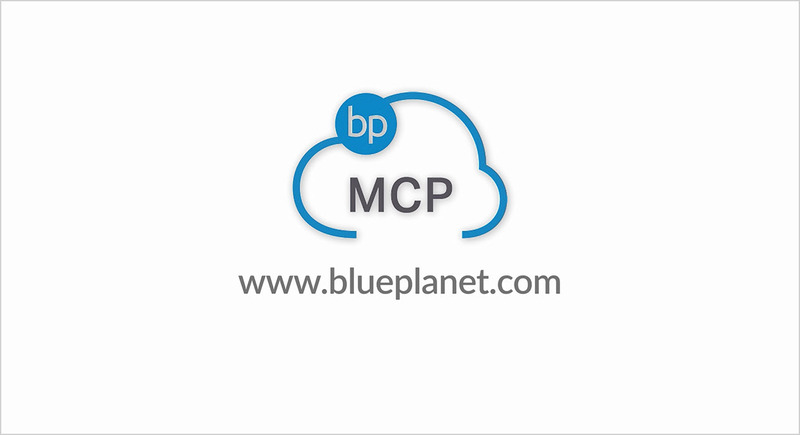 With respect to SDN control, Blue Planet MCP has a clear advantage: it is founded on Blue Planet’s open, extensible software architecture. Blue Planet is a proven platform that offers centralized control and automation, and ease of integration with higher-layer business applications and B/OSS through open interfaces. 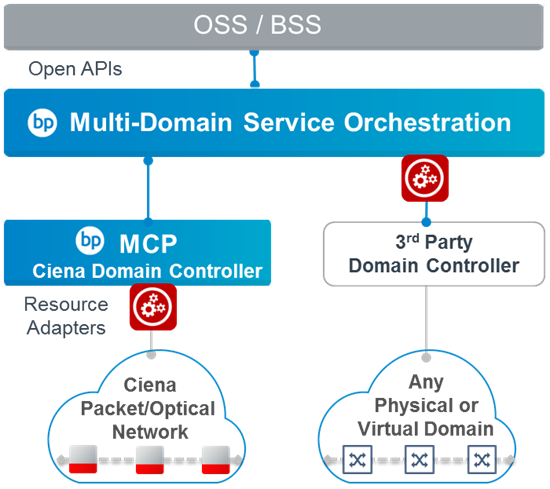 The Blue Planet Resource Adapter framework has been leveraged within MCP for granular Fault, Configuration, Accounting, Performance, Security (FCAPS) management of Ciena’s packet and optical portfolio. Additional microservices include end-to-end service provisioning and management across the Ciena domain, based on discovered and planned network resources. A scalable, multi-layer Path Computation Engine (PCE) computes optimized working and restoration paths, and signals dynamic configuration to the network elements. A comprehensive information model stores the entire network and service topology, providing the necessary abstraction to support programmatic control. Real-time aggregation and analysis of network utilization and performance monitoring metrics provide the centralized intelligence to drive service assurance and online network planning. All the above capabilities roll up into an MCP domain controller that provides fully integrated lifecycle operations. This level of automation and intelligence is a far cry from traditional, closed network management systems (NMS) that are often constrained to a single technology layer or product family, and lack the scalability for end-to-end management of network resources, let alone end-to-end planning and assurance of the services running on top of that infrastructure. Above all, flexibility of deployment is a key differentiator of SDN in comparison to legacy systems. This is essential, as each communications service provider (CSP) or Internet content provider (ICP) has a unique network, composed of multi-vendor multi-domains. Also, their operational environment is composed of multiple interconnected systems. With the benefit of open APIs, SDN Controllers can integrate seamlessly with existing systems, and each other, to support overarching business applications. As shown in Figure 2, Blue Planet MCP controls the Ciena domain, whereas a 3rd party domain controller manages another vendor or technology domain. In order to automate services from end-to-end across multiple domains, Blue Planet Multi-Domain Service Orchestration (MDSO) functions as an agnostic, higher-tier service orchestration layer. SDN adoption is picking up pace amongst operators, notably in multi-layer transport networks, with an astounding 15% growth quarter on quarter, according to ACG Research’s Q3-2016 worldwide Transport/Multi-Layer SDN report. Blue Planet’s pedigree, coupled with Ciena’s leadership in SDN-enabled optical and Ethernet infrastructure, has earned the company a top 5 ranking for overall multi-layer SDN across Metro, Edge, Core, and Control Software. As the market continues to evolve, Ciena is committed to working with its ecosystem partners and customers alike, to deliver on SDN’s objectives of service agility and operational simplicity.